All things FDO: FDO product updates, user best practices, fundraising tips, expert advice, and more! Organization search just got even easier in new FDO. We listened to the valuable feedback of FDO subscribers and worked hard to redesign your search by organization experience. Our goal is to continuously evolve FDO to ensure we bring you the best grant prospecting tool available. 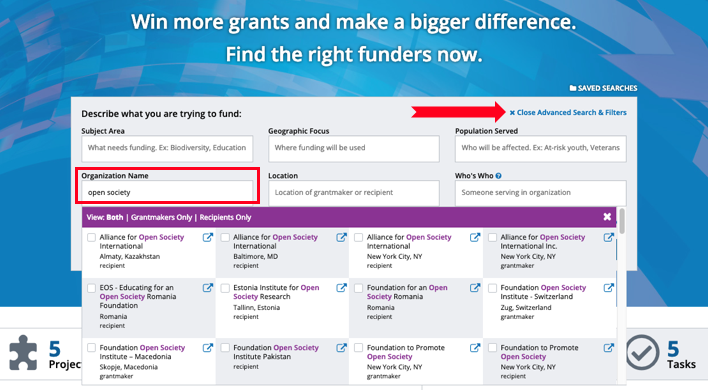 Use the Organization Name search box to look for a Foundation or peer Grant Recipient*. When you enter an organization name, a full list of organizations will appear. This new layout is much easier to navigate, to ensure you can easily find organizations. You can now define if you want to see Grantmakers only or Recipients only, or both. To view a profile directly, click on the flyout icon in the top right hand corner. 💡Tip: You may also select multiple organizations and all will appear in your search results. We look forward to sharing other future FDO developments with you all. Happy fundraising! If you are like most nonprofits, your organization is often strapped for capacity. In fact, on average, most nonprofits spend a mere 2% of their budget to support key operations like marketing, technology, or human resources, while peers in the corporate sector typically invest upwards of 35% of their budget on these functions. Engaging skilled volunteers (also known as pro bono service) can be an effective way to bridge the capacity gap. It's important to recognize volunteers aren’t “free” and in order for skilled volunteerism to be effective, your organization must be ready to make the most of this valuable contribution of time and talent. Strong executive leadership: An engaged leader will not only inspire the volunteer team to connect with your organization’s mission but also ensure access to the support and resources necessary to a project’s success. Potential to create deep social impact: Organizations poised to create deep social impact make great candidates for skilled volunteer projects. A nonprofit with a strategic direction and measured outcomes can engage skills-based volunteers in contributing meaningful impact toward social change, which supports not only the organization’s mission, but also volunteer enthusiasm for the project. Organizational stability: Before engaging skilled volunteers, a nonprofit should be in a position of financial and operational stability. While no volunteer expects perfection from their nonprofit partner, and often the pro bono project can help build financial or operational capacity, the organization should not be in a period of staff or management transition or experiencing significant board turn-over. Without this stability, it is challenging to align a skilled volunteer project with an organization’s strategic direction, allocate the necessary resources to managing the project, and ensure the long-term sustainability of its outcomes. Commitment to capacity building: Since skills-based volunteerism focuses on building internal organizational infrastructure (i.e. not direct service activities), a nonprofit’s commitment to ongoing capacity building is essential. This commitment should start with senior leadership to ensure that your organization is willing to devote resources toward managing, implementing, and sustaining the results of your pro bono project. It takes time and resources to provide a positive volunteer experience. Nonprofits that evaluate volunteer experiences and plan for strategic volunteer engagement (including when to say “no” to support) will understand how to put volunteer time and talent to the best use possible to maximize the impact of your pro bono project. Join Candid and Common Impact on February 21, 2019 at 2:00 pm ET for the High-Impact Volunteer Engagement: Developing Effective Capacity Building Projects webinar, to learn more about these six factors for engaging in successful skills-based engagements along with an introduction on how to scope the right-sized project for your organization. Participants will receive Common Impact's Project Portfolio and Scoping Template to help them think through ways to identify organizational challenges and narrow them down into skills-based projects. In advance of the webinar, we encourage you to work through the Common Impact Organizational Readiness Wizard to understand key areas where your nonprofit may need support and prepare questions for the live, online training. You need the best prospecting tool available, Foundation Directory Online is committed to meeting your needs as a fundraiser. Last year was a big year for FDO, we added nearly 70,000 new grants each week – that is a lot of data in one year! Good news, we are aiming for even bigger records in 2019. Your organization is doing important work; enabling your success is our mission. To learn more about FDO, check out our handy guide. We’re excited! Foundation Center and GuideStar have joined forces to become Candid. First things first: Foundation Directory Online will remain unchanged. You’ll still experience the same great prospecting tool you rely on to win funding, and the same high levels of customer service. Why, then, have we joined forces to become Candid? The answer is pretty simple: Foundation Center and GuideStar have always been committed to the same thing: empowering individuals and organizations with the insights to change the world. Together, our combined experience and expertise will allow us to do more than ever before. For more information head to candid.org or email us. NEW My FDO is our first of many new feature launches for 2019! Make the most out of your prospect research, explore the benefits of My FDO. 🚀 Take your prospecting to the next level, rate your Grantmakers with the NEW Grantmaker Assessment tool. Simply complete your personal assessment of the Grantmaker - this rating will live on their profile. You can start straight from the Grantmaker profile. My FDO is your new workspace, better tools built to help you win the funding you need to succeed. During the eight years I’ve been a consultant, I’ve worked mainly with social justice nonprofit organizations with budgets of $5 million or less. These groups typically have one, or if they’re larger, up to three full-time development staff members. They’re stretched thin generating resources to meet their organizations’ immediate needs. Few have time to focus on a long-term fundraising vision or to invest in planned giving, due to limited staff capacities and resources. These organizations may think encouraging planned gifts is a good idea, but there’s usually something else that takes precedence, like writing grant proposals and overseeing major gift campaigns. I get it. In a small development shop, raising money for current programmatic expenses is priority one. You, too, may have thought your organization should start a planned giving program. But you may be paralyzed about moving forward because of the seeming complexity of legacy gifts. Or you can’t imagine talking with donors about estate gifts without feeling crass. On January 24th, I’ll be leading a Foundation Center planned giving webinar that will address these barriers and hopefully move your organization forward into launching a planned giving effort. There are simple steps even small, grassroots groups can take to encourage legacy gifts. Below are some of the strategies I’ll outline in the webinar that can support your efforts. A planned giving case for support focuses on why your organization should exist decades from now. Many of our organizations address complex problems that will take more than a lifetime to solve. Other groups focus on issues that may be resolved in the foreseeable future. Groups that work on entrenched challenges or that have evergreen appeal (like arts, education, and health) are in a stronger position to make the case they’ll need to thrive in 50 years. Once you have developed your case for planned giving support, next step is to propose this plan to your best matched funders. Use FDO to manage your list of past funders or find new funders. In FDO, you’ll easily be able to see how much a grantmaker supports your specific mission, use this handy tool to prioritize your prospects. The vast majority of legacy gifts to nonprofit organizations are made through living trusts and wills. Some of your donors or their attorneys may contact you for language they can include in these documents to designate an estate gift to your organization. It’s simple to have that language ready for such inquiries. When donors are creating or revising an estate plan, it should be easy for them to find the information they’ll need to make a legacy gift to your organization. Set up a page on your group’s website to provide basic information (like bequest language) supporters will need to include your organization in their plans. Naming an organization as a beneficiary in an estate plan is a significant decision. Let your universe of supporters know that you’ve created a legacy society to recognize donors who have remembered your group in their plans. A legacy society is a way to encourage donors to tell you about their estate gift intentions. Setting up a basic planned giving infrastructure will facilitate your supporters to make estate gifts. Once you start learning of intended legacy gifts, you’ll want to do all you can to deepen your relationships with these special supporters. Make sure to join me in the upcoming January 24, 2019 webinar, Planned Giving Success: Strategies to Maximize Donor Gifts, to learn more about establishing strategies and systems to strengthen donor relationships and encourage legacy gifts, so you’re well equipped for planned giving success. About Stan Yogi: More than 28 years of experience with nonprofit organizations in fundraising and grantmaking. He was Director of Planned Giving at the ACLU of Northern California for 14 years, where he was also responsible for securing foundation grants and raising major annual gifts. Prior to joining the ACLU staff, he was a Program Officer for California Humanities, a statewide organization that awards grants for cultural and educational programs. He is the co-author of the award-winning books, Wherever There's a Fight: How Runaway Slaves, Suffragists, Immigrants, Strikers, and Poets Shaped Civil Liberties in California (Heyday, 2009) and Fred Korematsu Speaks Up (Heyday, 2017). During my 10 years teaching and training nonprofits around the world, I have found that some of the biggest challenges they grapple with in seeking funding are related to differentiating themselves from the plethora of other great causes in the market; establishing their legitimacy in a field in which the few fraudulent ones have created fear, uncertainty and doubt in the minds of donors; and identifying which donors could potentially be interested in their cause, have the capacity to give and are accessible. If you ask any group of U.S.-based foundations their primary source of information about a nonprofit with which they are unfamiliar most of them will likely say that they google to find out about them. In the case of international nonprofits looking to raise funds in the U.S., the strength of their digital presence is critical in that it helps to convey the credibility of the organization, in the absence of a physical location the U.S. for funders to easily visit. In a market that has over 1.5 million nonprofits, international nonprofits looking to differentiate themselves without the advantage of having operations or programming in the U.S. need to leverage digital channels to convey their unique value proposition to compel support. An effective digital presence for any nonprofit organization conveys a sense of trustworthiness, authenticity and clarity of purpose to the funders. International nonprofits also need to be able to utilize resources available to them online, such as GrantSpace, to learn about the U.S.-based foundations that would potentially be interested in funding them. FDO is a key resource to discovering U.S. funders and unlocking the giving priorities of U.S. foundations that may be aligned with the causes of international nonprofits. Finding out who among them are aligned with the United Nations Sustainable Development Goals (SDGs), such as SDG Funders, can help nonprofits to engage with funders online, as a means to potentially enter into their respective grantmaking processes. In the November 15th webinar, Expand Your International Organization’s Presence to Attract U.S. Funders, I will draw on my experience working with international nonprofits and helping nonprofits to establish their presence in the U.S. and online, to provide some you with practical strategies and tips to enable your international nonprofit to most effectively access U.S.-based foundations and to put its best foot forward when engaging with them. Register today! Elizabeth Ngonzi is an experienced executive, award-winning human rights advocate, and seasoned educator dedicated to enabling youth and women worldwide to reach their full potential. She does so by developing platforms that enable them to reach their potential. Learn more about Elizabeth Ngonzi here. A donor-advised fund is a giving tool that charitable individuals use to tax-effectively consolidate, accrue, and grant assets to public charities. You can think of it as an investment account dedicated solely to your charitable giving. Donor-advised funds are managed by sponsoring organizations, which are themselves 501(c)(3) tax-exempt organizations. Sponsoring organizations generally fall into three categories: community foundations, single-issue organizations, or national organizations, such as Vanguard Charitable. HOW DOES A DONOR-ADVISED FUND WORK? A donor contributes to a DAF and takes an immediate tax deduction. The charitable assets now legally belong to that DAF’s sponsoring organization. The donor, and other named individuals, often become a DAF advisor. The DAF advisor can recommend how the assets in the DAF are invested; proceeds grow tax-free. The DAF advisor can recommend grants to the nonprofits he or she wishes to support. The sponsoring organization will conduct due diligence and, if that research shows the organizations are eligible to receive tax-deductible contributions, issue the grants to the charities. Note that specific policies vary by sponsoring organization—most donors weigh the different options before opening a DAF. WHY DO DONORS USE A DONOR-ADVISED FUND? 1. Convenience: Instead of having to personally track all their giving, advisors can use DAFs as a centralized hub to simplify their philanthropy. One contribution can fund multiple donations to an advisor’s favorite charity or charities. 2. Increased giving potential: Assets in a DAF are invested tax-free, enabling many advisors to grant much more to charity in the long run. 3. Flexibility: In the wake of crises such as last year’s hurricanes, DAF advisors can respond quickly. Charitable resources in a DAF are “primed” and ready for rapid disbursal. 4. New charitable assets: Most sponsoring organizations can accept donations of non-cash assets such as appreciated securities. These often-overlooked charitable assets pull additional resources into the philanthropic community. WHO GIVES THROUGH DONOR-ADVISED FUNDS? With nearly 1,000 sponsoring organizations and more than 280,000 individual DAFs,3 some with multiple advisors, it is hard to generalize about this diverse philanthropic population. A DAF advisor may be a retiree who opened a DAF so that he or she could continue giving after leaving work. Or, a DAF advisor may have found a private foundation to be too costly and burdensome, and opted for a cheaper giving tool with more flexibility. Many DAFs are advised by families who have pooled their charitable resources and view philanthropy as a communal endeavor. The average DAF advisor in the United States has roughly $300,000 in his or her account,4 and nonprofits report that gifts from DAFs tend to be larger than their typical contributions. The average gift from a Vanguard Charitable advisor, for example, is nearly $12,000. Anonymity is a concern for some nonprofits working with DAF advisors. However, only 5 percent of Vanguard Charitable grants are anonymous.6 The remaining 95 percent allow nonprofits to engage in some form of stewardship. WHAT ARE DAF ADVISORS LOOKING FOR IN NONPROFITS? Vanguard Charitable advisors often discuss the best way to identify charities doing meaningful work in their area of interest. One way that you can distinguish your organization from similar ones is to provide comprehensive and up-to-date information to GuideStar. Vanguard Charitable is one of more than 200 sites and programs that share GuideStar Nonprofit Profile information with their users. DAF advisors appreciate transparency, as additional information enables them to make more informed, strategic decisions. Maintaining an updated GuideStar profile can pay dividends: As they research charities to support, Vanguard Charitable advisors make more than 15,000 searches each month via the GuideStar National Nonprofit Directory. Actively promote your ability to accept grants from DAFs. Consider mentioning donor-advised funds on your website, in solicitation offers, and on promotional materials. You can also suggest that your donors with DAFs set up automatic recurring grants. Educate your entire organization about gifts from DAFs so that they can be processed smoothly. Remember: DAF advisors are interested in efficiency and convenience! For example, you should not send a tax receipt to DAF advisors, as they’ve already received one from the sponsoring organization, but you may send a thank-you letter to help stay connected. Steward sponsoring organizations. Don’t send them solicitation letters, but have a working knowledge of prominent sponsoring organizations. Feel free to send them an acknowledgment letter when you receive a gift. Be familiar with IRS rules concerning DAFs. Grants from a DAF cannot result in impermissible benefit to the DAF account advisors, their family members, or the donor to the DAF account. Grants must be made exclusively for charitable purposes. Vanguard Charitable includes language with each grant to help you understand how the funds can be used. I like to tell nonprofits to think of us as members of the same team. Our donors are your donors, and our mission is to increase philanthropy in the United States and maximize its impact over time. We cannot do this without you and your vital work. Together we can continue to help create a better world. Rebecca Moffett is Vanguard Charitable’s Chief Strategic Planning Officer. Rebecca is focused on building awareness of the benefits of strategic philanthropy and is committed to improving donors' giving experiences. In her charitable endeavors, Rebecca is an alumnus of Big Brothers Big Sisters of South Eastern Pennsylvania and is also active in her church community. She earned her bachelor's degree and MBA from Saint Joseph's University. Recipient Profiles help you discover new prospects you may have missed in your grant search and help you understand how to approach funders. Now you can easily gather key fundraising insights using FDO’s interactive Recipient Charts. You can access Recipient Profiles and all insights on grant recipients in FDO Professional. [Tip 1] Who's funding your mission? [Tip 2] Where are relevant funders located? [Tip 3] How large are grants awarded to your cause? Ready to take the next step in your grant search? Now that you’ve had some time to search for prospects and started building your prospect list, use these three steps to convert prospects to funders. Review the list of staff and affiliations within your chosen grantmaker profiles by navigating to the Who’s Who section of the grantmaker profile. See who you’re connected to at the foundation with FDO’s LinkedIn integration. The LinkedIn icon will appear next to staff you are connected to—click on the LinkedIn icon to open their profile from FDO (functionality accessible in Professional only). To see your connections to grantmakers make sure you’re also signed in to LinkedIn. Look beyond searching for open RFPs and connect with funders who fit your work and mission. Understand funders’ priorities and start cultivating partnerships. Introductions are one of the most effective ways to open the door with a new funder. Have you tried these FDO top tips on how to approach funders? Take the next step and reach out to funders that match your organization’s mission and program. You can also apply these best practices and view this FDO sample outreach letter from our development expert. We add nearly 100,000 new grants and RFPs weekly, so you can always have access to the latest grantmaker data and insights. Equipped with these insights, strengthen your proposals to make them most appealing to funders. When you’ve completed a search that you might like to review again later, make sure you use the Save icon at the top of your search results. You can then find your saved search in Workspace or on your homepage. With your FDO search results, sort by any column to view prospects using the different data points (amount funded, grant count, total giving, city, state, or by name) depending on what you’re looking for. With each of your searches, see how much funders are giving to your cause based on your search criteria in the Amount Funded column. Amount Funded is adjusted based on your search criteria. (Details on Grants available in Professional). From the grantmaker profiles, use the interactive charts and map presented at the top to see if it is a funder you would like to keep on exploring and if the funder might be a fit. 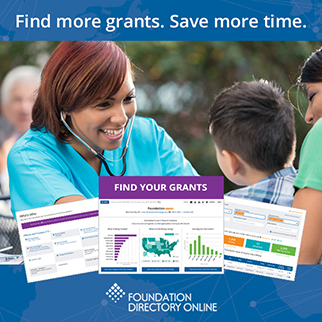 Drill down into the charts and map to view more detail on the funders’ mission priorities (Grantmaker Charts & Map are interactive in FDO Professional only). Once assessing the grantmaker, you can then pull key data points on the grantmakers’ giving aligned to your mission from these charts and map. Explore the grantmakers’ grants and recipients to further understand the funder’s mission and giving alignment. What you learn about funders from the grantmaker profiles will also help you approach your best matched funders. Within each grantmaker profile, use Other Funders to Consider to guide you in your search for additional funders that have similar giving patterns based on subject area, geographic area served and grant amounts. Keep up-to-date on grantmakers’ leadership changes, new priority areas and support changes, plus find out about new grantmakers in your state with Update Central. You can sign up to receive monthly email updates about grantmakers, or run customized reports by state directly in FDO’s Update Generator. Access Update Central by navigating to the Workspace menu and selecting Update Central.